In our last blog we looked at Top 5 Tips for Entrepreneurial Success. One of these was the importance of keeping customers at the forefront of everything that you do and engaging with them at all the different stages of their relationship with you. In these days of digital marketing, there are many different ways of engaging with customers as part of your marketing strategy. We, ourselves, make it a priority to contact our all our new business loans clients at each stage of their application process to ensure they are aware that support is readily available from Fair Business Loans. In this article we explore some of the marketing terms that you may have heard but have not fully realised their potential for not only marketing your product or service but also engaging with customers in a way that will keep them coming back to you again and again. This stands for pay-per-click. It is a way of buying visits to your website. You pay to host an advert on a search engine or another website and when people click on that advert, they are redirected to your own website. Although you do have to pay, when PPC works well, this more than outweighs the cost of paying for the advert. Google AdWords is the best-known PPC advertising system in the world. It enables businesses to create ads that appear on Google’s search engine and other Google properties. These businesses can bid on specific keywords and every time someone searches for these keywords, Google will select related adverts to appear in the available advertising space on the search results page. These adverts are selected by Google on a combination of factors, including their quality and relevance to the keywords, and the size of their keyword bids. In that sense it is a kind of advertiser’s auction. This stands for Search Engine Optimisation. This is activity that attempts to improve search engine rankings, so that when customers search for a product and service like yours then your website would appear in the list of search results from Google or other search engines. So you need to ensure that your pages include relevant words in easy to find places! 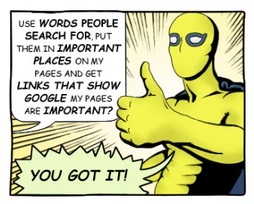 We like this image above - part of a cartoon by Redevolution - that sums up the meaning of SEO! We are all increasingly aware of the importance of social media but its value in engaging with customers cannot be overstressed! Different social media can be used effectively to communicate key information about your product or service, but can also be a forum for you to build your brand and personality and to enable customers to interact with you. Great content - whether it’s your website or blog or any other media - encourages people to visit and link to your pages and this can also boost your search ratings. The content can be any combination of text, images, video, audio and multimedia, but needs to be interesting and engaging and stand out from the crowd. It also ideally needs to offer customers the ability to comment in order to keep up the interaction we mentioned above. Email can be used to seek out new customers or keep in touch with existing customers and can increasingly be tailored to the specific audience. Every word matters so use them carefully! People receive a lot of emails and research has been done as to which words tend to encourage customers to open emails rather than instantly delete them. UX is User eXperience i.e. making sure that the interaction between the user and your company is as easy, accessible and enjoyable as it can be. Even if your company is currently small, you need to ensure that consumers always have a pleasant experience interacting with you and that this experience is consistent across whichever channel they choose to interact with you. Even if your product or service is excellent, consumers may still choose not to use you again if they have not been delighted with their overall user experience with you. We hope that this has been a useful overview of how you can use digital marketing to interact with new and existing customers and to help build your brand and your identity. For help and support in growing your business and small business finance, always remember that Fair Business Loans are here to help - and we are confident that your experience with us will be second to none!